The one that got away. Gone too soon. Taken from us before its time. Yes, we're talking about Mini Cinnamon Churros. 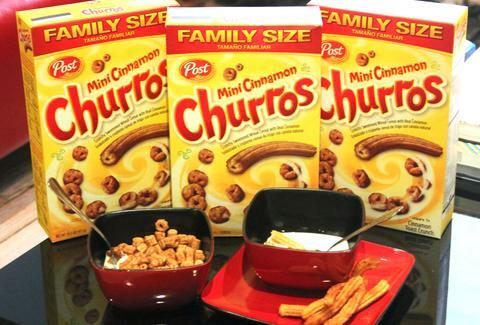 A Post brand cereal, Churros were recently discontinued. But before the elusive breakfast disappeared, we scored a few boxes to answer the burning question: does Churros cereal hold up against the real deal? We tried 'em in some milk (duh), then bought some actual churros and tried those in milk, as well as on their own, in pursuit of hard-hitting churro journalism. This is what we discovered. Are generic cereals worth the value vs. the real stuff? Churros in milk are honestly pretty gross. They just get soggy, and it basically takes away most of the flavor. 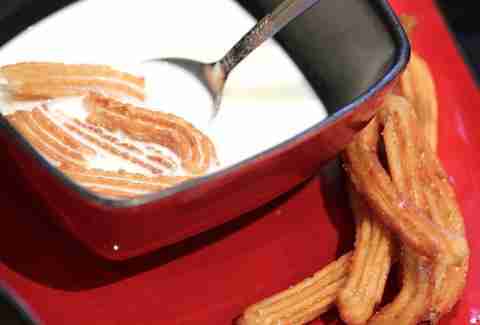 Churros are already kind of soft and chewy, so putting them in milk just enhances that, and it's not pleasant in the least. Even though you typically dip churros in delicious melted chocolate, it’s not the same as submerging them in milk, since the chocolate acts like more of a topping or a coating rather than something that actually seeps into the churro’s very being. I do not want to try these in milk ever again. 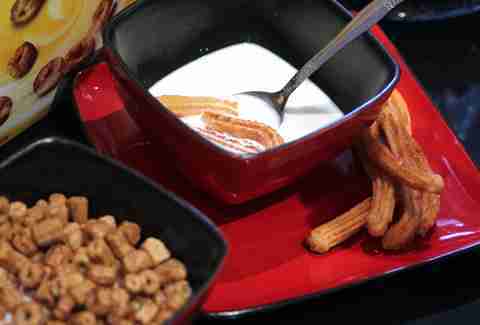 Churros cereal in milk is delicious. Of course, this isn’t a 100% fair comparison, seeing as cereal is obviously made to be put in milk. That said, this is great. 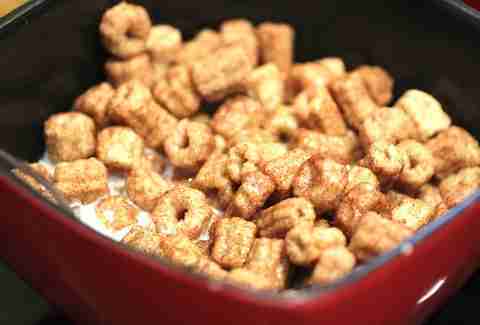 The cereal has a crunch that is superior to an actual churro's slightly crunchy exterior. These things taste somewhat like churros, but really they taste exactly like what they are: The cerealized version of a churro that might actually taste a little more like Cinnamon Toast Crunch. But, like, a better version of Cinnamon Toast Crunch. They also smell like cinnamon-sugar dusted matzah brei. Even when they get soggy, they’re pretty palatable. One of the best parts of these is how the cinnamon sugar comes off (though some still remains on the actual cereal pieces) into the milk to create a delicious after-cereal drink. When I was younger, I never wanted to drink the milk once I ate my cereal, but my babysitter made me and I thought she was the embodiment evil. If I had been eating these, that would not have been a problem. You've been vindicated, Eunice McCoy... sorry I was such a brat. The actual churros, not in milk, fared better against their mini cereal brethren, though the two still have some marked differences. The regular churros have some outer crunch that was lost when they took a swim in the milk, but they’re obviously still softer since they’re not cereal. The churros also are sugar coated in comparison to the cereal, which is distinctly covered in cinnamon, with some sugar as well, but primarily cinnamon. This difference in appearance is evidenced in the taste too, with the typical churro having a subtle sugariness and not so much cinnamon, as opposed to the cereal which tastes like sweetened cereal dusted with cinnamon. There’s no doubt, though, that your average, simple churro served as cereal inspiration when it comes to the physical shape and texture. Both are rounded with the iconic ridges that are integral to any true churro. Conclusion Basically, this is not an either/or situation. Both should have a place in your stomach and heart for different reasons. Churros cereal isn’t quite similar enough to actual churros to act as a replacement, but it’s a perfectly delicious breakfast or snack item that will still give you enough of the churro taste to suffice. Also, do not chop up a regular churro and stick it in milk like it’s cereal. It’s not, and you will live a life of regret afterwards. Though you’re probably already living that now because these are now discontinued and you’ll probably never get to try them... unless you find an old box at the grocery store. If you do, grab it immediately. Rachel Freeman is a food/drink editorial assistant at Thrillist, and eating actual churros in milk will now haunt her dreams. Follow her to happier churro memories at @rachelifreeman.